Art Director Emily Rigsby brings a creative energy to curating the over 300 pieces that hang at The Vendue. 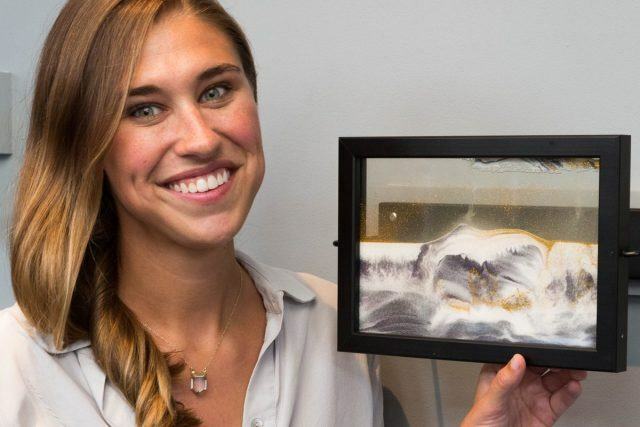 Emily is a native Charlestonian and graduate of The College of Charleston where she received her Bachelor of Arts in painting and art history. She began her career as an intern at the Halsey Institute for Contemporary Art, and it is during her time there that she met Lisa and Jon Weitz, owners of The Vendue. Emily has been with the hotel since 2015 and is dedicated to bringing art in all forms to the hotel. Please join her at the daily art reception from 4 – 5 PM. Where did your interest in the arts begin? My family has been in Charleston for generations. All of them. Not a single person in my family has anything to do with the arts. They support it, they appreciate it, but it’s never been something you would consider as a career. I went to Ashley Hall from the time I was 2 years old until I graduated high school. It’s an all-girls school here in Charleston with the motto “where girls are champions”. The teachers and administration of Ashley Hall drove it into my young brain that I could do anything and be anything I wanted. I feel so fortunate to have had an amazing education from people who were genuinely passionate about teaching. They also have an incredible art program, which clearly shaped my interests. When my mom realized my interest in the arts, she signed me up for I think every art-related summer camp there was. My mom is a numbers woman (she’s in banking), so I think she wanted to foster my creative energy. I went to the Gibbes Museum summer camps, I took drawing lessons from an artist that lived down the street, I was constantly making things. How did your interest in the arts develop as you were deciding on a career? Upon graduation from Ashley Hall, I was ready to get the heck out of Charleston – go somewhere that I didn’t know anyone and experience a new “city”. I chose Auburn University for their acclaimed architecture program. Talk about culture shock. From a classroom of 13 girls to a classroom of 300. From cultural mecca Charleston to football and farming obsessed Auburn. From a water-baby lifestyle to landlocked. It was terrifying and wonderful at the same time. But when I came back to glorious, sunny, artful Charleston for the summer, I knew it was my place. I knew that I wanted a future in the arts and I figured it was better to start building my professional network in the town I knew I wanted to live in, so I transferred back to the College of Charleston. C of C was the perfect place to test out the different areas of the art world (they have an incredible School of the Arts). I ended up focusing in painting and art history. Thinking I would pursue painting as a career, I thought it would be helpful to learn about galleries, so I signed up for a class about gallery management. The first day, it all clicked. Working with artists, collectors, art historians, curating – it’s an art form in itself. And I loved it. I went up to the professor after class and asked if I could take her out to coffee and pick her brain. Over the years, she became my mentor and dear friend. Where did you begin your career after college? I started interning and volunteering in galleries as much as they would let me be in their space. I remember my first day as an intern at the Halsey, I was unpacking Aggie Zed sculptures (now one of my favorite artists). It was like Christmas unwrapping her beautiful little treasures. In that moment, I remember thinking to myself “I’m going to stay here until they give me a job”. Thankfully it worked out and I ended up working there as Membership & Development Coordinator for three years. During that time, I met the owners of The Vendue and kept in touch with Rob and Megan Lange. 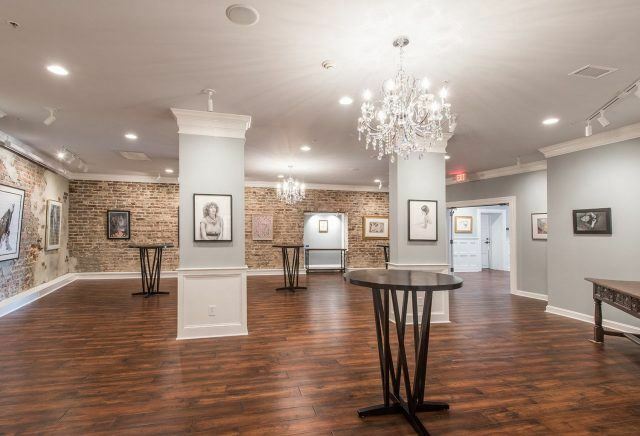 Tell us about your experience at The Vendue and more about the arts scene in Charleston. When I heard they were looking for a new art docent at The Vendue, I was intrigued. Now that I’ve been at The Vendue for over a year, I can honestly say that I am so excited to be in this position. I think I have the best job in the hotel – maybe even in the Charleston art world. Who else has the opportunity to work with a dozen local galleries who represent artists from all over the world? It’s like I get an insider look and it’s a win win-win for all parties. 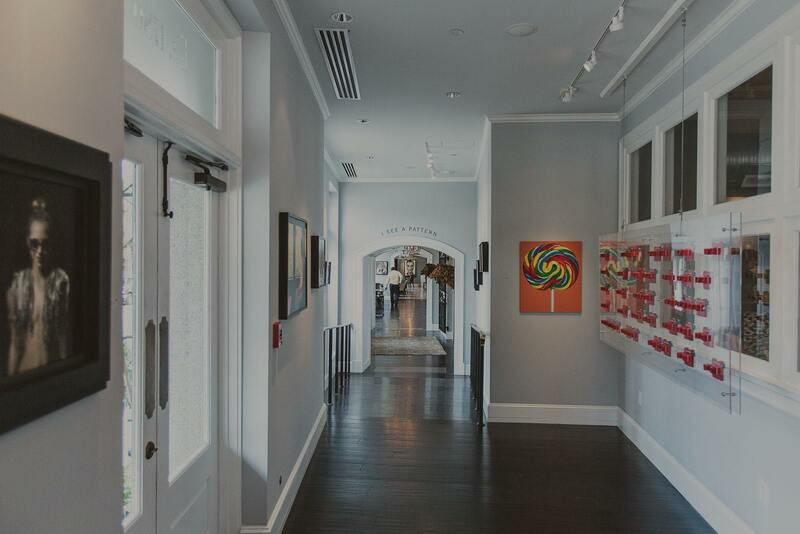 The artists get broader exposure, the galleries gain wall space and come together in one space to collaborate, and the hotel provides an incredible amenity for our guests. Recently, I’ve been talking a lot about how Charleston is at a turning point. I think Spoleto put Charleston on the map as a tourism destination when it started here in the 70s. 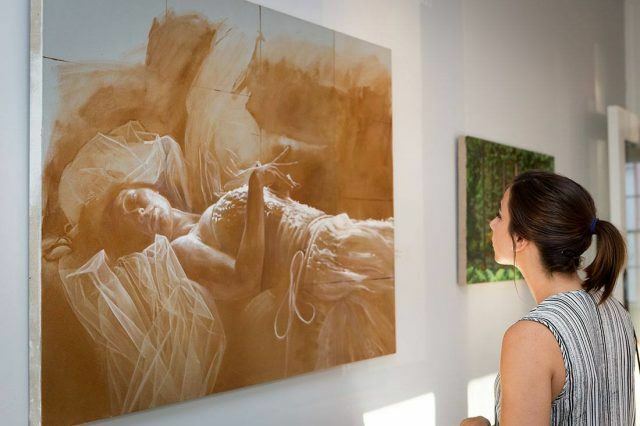 Charleston became an accepting place for artists and galleries. However, as a traditional historic Southern town, we see a lot of traditional Southern art – think marsh scenes, birds, and hunting dogs. Only in the past few years have galleries taken a more progressive contemporary turn. We try to align our hotel with those galleries – the ones stepping out of the wildlife box. With the Vendue, it is my goal to foster and promote adventurous, progressive, contemporary art in Charleston.